Their inclusion in 2019's official list means many smartphones should gain them in the second half of the year. 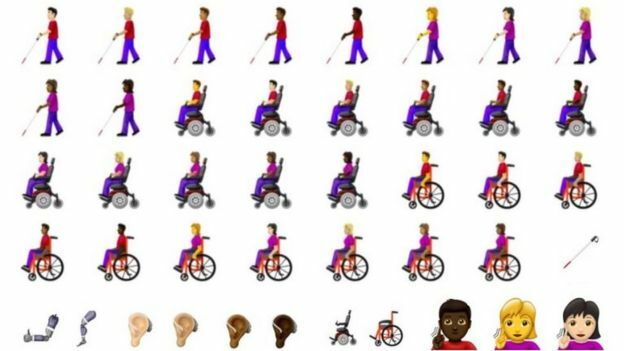 "Social media is hugely influential and it's great to see these new disability-inclusive emojis," said Phil Talbot, from the disability charity Scope. "Up to now, disability has been greatly underrepresented. "We'd also like to see greater representation of disabled people and disability across all parts of the media and social media." The various platform owners - including Apple, Google, Microsoft, Samsung, Facebook and Twitter - can tweak Unicode's designs to their own liking but are supposed to ensure that each character remains recognisable from one product to another. Its addition follows a campaign by Plan International UK, a girls' rights charity that held an online vote in 2017 for what a period-themed emoji should look like. "For years we've obsessively silenced and euphemised periods," said Lucy Russell, head of girls' rights at the group. 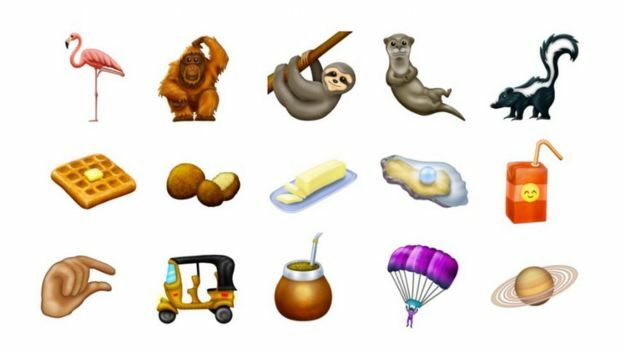 "An emoji isn't going to solve this but it can help change the conversation. Ending the shame around periods begins with talking about it".